Accurate demographics of atheism are difficult to obtain since conceptions of atheism vary across different cultures and languages from being an active concept to being unimportant or not developed. In global studies, the number of people without a religion is usually higher than the number of people without a belief in a deity and the number of people who agree with statements on lacking a belief in a deity is usually higher than the number of people who self-identify as "atheists". According to sociologist Phil Zuckerman, broad estimates of those who have an absence of belief in a deity range from 50 to 75 million people worldwide. Other estimates state that there are 200 million to 240 million self-identified atheists worldwide, with China and Russia being major contributors to those figures. According to sociologists Ariela Keysar and Juhem Navarro-Rivera's review of numerous global studies on atheism, there are 450 to 500 million positive atheists and agnostics worldwide (7% of the world's population), with China having the most atheists in the world (200 million convinced atheists). Of the global atheist and non-religious population, 76% reside in Asia and the Pacific, while the remainder reside in Europe (12%), North America (5%), Latin America and the Caribbean (4%), sub-Saharan Africa (2%) and the Middle East and North Africa (less than 1%). The prevalence of atheism in Africa and South America typically falls below 10%. According to the Pew Research Center's 2012 global study of 230 countries and territories, 16% of the world's population is not affiliated with a religion, while 84% are affiliated. Furthermore, the global study noted that many of the unaffiliated, which include atheists and agnostics, still have various religious beliefs and practices. Historical records of atheist philosophy span several millennia. Atheistic schools are found in early Indian thought and have existed from the times of the historical Vedic religion. Western atheism has its roots in pre-Socratic Greek philosophy, but did not emerge as a distinct world-view until the late Enlightenment. Discrepancies exist among sources as to how atheist and religious demographics are changing. Questions to assess non-belief may ask about negation of the prevailing belief, rather than an assertion of positive atheism. Also, self-identification is not congruous to people's lack of beliefs automatically. For instance, merely not having a belief in a god, for whatever reason, does not automatically mean that people self-identify as an "atheist". According to the 2012 WIN/Gallup International Survey, the number of atheists is on the rise across the world, with religiosity generally declining. However, other global studies have indicated that global atheism may be in decline due to irreligious countries having the lowest birth rates in the world and religious countries having higher birth rates in general. The demographics of atheism are substantially difficult to quantify. Words like, "God" or "atheism" seldom translate well across cultures or languages, and if they are there, they have variant meanings which make cross cultural comparisons tenuous. As such, it can be hard to draw boundaries between atheism, non-religious beliefs, and non-theistic religious and spiritual beliefs. Furthermore, atheists may not report themselves as such, to prevent suffering from social stigma, discrimination, and persecution in some countries. Because some governments have strongly promoted atheism and others have strongly condemned it, atheism may be either over-reported or under-reported for different countries. There is a great deal of room for debate as to the accuracy of any method of estimation, as the opportunity for misreporting (intentionally or not) a category of people without an organizational structure is high. Also, many surveys on religious identification ask people to identify themselves as "agnostics" or "atheists", which is potentially confusing, since these terms are interpreted differently, with some identifying themselves as being agnostic atheists. Additionally, many of these surveys only gauge the number of irreligious people, not the number of actual atheists, or group the two together. For example, research indicates that the fastest growing religious status may be "no religion" in the United States, but this includes all kinds of atheists, agnostics, and theists. According to the World Factbook, Non-religious people make up 9.66%, while one fifth of them are atheists. Statistics on atheism are often difficult to represent accurately for a variety of reasons. Atheism is a position compatible with other forms of identity including religions. Anthropologist Jack David Eller, states that "atheism is quite a common position, even within religion" and that "surprisingly, atheism is not the opposite or lack, let alone the enemy, of religion but is the most common form of religion." Furthermore, he observes that "some atheists call themselves "spiritual", and as we have shown above, atheism in its broadest sense does not preclude other religious concepts like nature spirits, dead ancestors, and supernatural forces." In many cultures, little conceptual or practical distinction is made between “natural” and “supernatural” phenomena and the very notions of "religious" and "nonreligious" dissolve into unimportance, especially since people have beliefs in other supernatural or spiritual things irrespective of belief in gods. For instance, in Netherlands people who lack of beliefs in gods do have a variety of beliefs in other supernatural entities or things. Globally, some atheists also consider themselves Agnostic, Buddhist, Hindu, Jains, Taoist, or hold other related philosophical beliefs. Some, like Secular Jews and Shintoists, may indulge in some religious activities as a way of connecting with their culture, all the while being atheist. Therefore, given limited poll options, some may use other terms to describe their identity. Some politically motivated organizations that report or gather population statistics may, intentionally or unintentionally, misrepresent atheists. Survey designs may bias results due to the nature of elements such as the wording of questions and the available response options. Statistics are generally collected on the assumption that religion is a categorical variable. Instruments have been designed to measure attitudes toward religion, including one that was used by L. L. Thurstone. This may be a particularly important consideration among people who have neutral attitudes, as it is more likely that prevailing social norms will influence the responses of such people on survey questions that effectively force respondents to categorize themselves either as belonging to a particular religion or belonging to no religion. A negative perception of atheists and pressure from family and peers may also cause some atheists to disassociate themselves from atheism. Misunderstanding of the term may also be a reason some label themselves differently. A majority (53%) of Canadians believe in God. What is of particular interest is that 28% of Protestants, 33% of Catholics, and 23% of those who attend weekly religious services do not. One quarter (23%) of those with no religious identity still believe in a God. Even when people directly claim to not believe in a deity, they still do not self-identify as “atheist.” For instance, 41% of Norwegians, 48% of the French, and 54% of Czechs claimed to not believe in a deity, but only 10%, 19%, and 20% of those respondents self-identified as “atheist,” respectively. In the United States, only 5% of the population did not have a belief in a god and out of that small group only 24% self-identified as "atheist", while 15% self-identified as "agnostic" and 35% self-identified as "nothing in particular". Though China is state atheism, 85% of the population practice various kinds of religious behaviors with some regularity. In the Netherlands, beliefs of "convinced atheists" are quite diverse: 41.1% of them believe in telepathy, 21.1% believe in reincarnation, 13.3% believe in life after death, and 1.6% believe in heaven. The percentages on telepathy and reincarnation were similar to the percentages of "religious people" in the Netherlands. Furthermore, the author of the study notes, "Thus, despite the fact that they claim to be convinced atheists and the majority deny the existence of a personal god, a rather large minority of the Dutch convinced atheists believe in a supernatural power!" A 2004 survey by the BBC in 10 countries showed the proportion of the population "who don't believe in God" to be close to 17% in the countries surveyed, however, 8% of the respondents specifically stated that they consider themselves to be "atheists". Diversity was observed in that "across the entire sample, almost 30% of all atheists surveyed said they sometimes prayed." Michael Newdow speaks at the Atheist Alliance International Convention. Members of secular groups are very likely to be atheists, but also more willing to hold unpopular views and explore new ideas thoroughly. A study on global religiosity, secularity, and well-being notes that it is unlikely that most atheists and agnostics base their decision to not believe in the gods on a careful, rational analysis of philosophical and scientific arguments since science testing scores in societies where atheism or theism is widespread, are just as poor and such societies have widespread supernatural beliefs besides gods. Reviewing psychological studies on atheists, Miguel Farias, noted that studies concluding that analytical thinking leads to lower religious belief "do not imply that that atheists are more conscious or reflective of their own beliefs, or that atheism is the outcome of a conscious refutation of previously held religious beliefs" since they too have variant beliefs such as in conspiracy theories of the naturalistic variety. In terms of apostasy, a greater proportion of people who leave religion, do so for motivational rather than rational reasons and the majority of deconversions occur in adolescence and young adulthood when one is emotionally volatile. Furthermore, Farias notes that atheists are indistinguishable from New Age individuals or Gnostics since there are commonalities such as being individualistic, non-conformist, liberal, and valuing hedonism and sensation. According to Phil Zuckerman, the majority of atheists and other secular people who were raised with a religion, leave their religion and beliefs in their late teens or early twenties while a smaller proportion do so at a mature age. A study on personality and religiosity found that members of secular organizations (like the international Center for Inquiry) have similar personality profiles to members of religious groups. This study found that members of secular organizations are very likely to label themselves primarily as "atheists", but also very likely to consider themselves humanists. It was also found that secular group members show no significant differences in their negative or positive affect. The surveyed individuals also had similar profiles for conscientiousness (discipline or impulse control, and acting on values like "pursuit of truth"). Secular group members tended to be less agreeable (e.g. more likely to hold unpopular, socially challenging views), as well as more open minded (e.g. more likely to consider new ideas) than members of religious groups. Luke Galen, a personality researcher, writes "Many previously reported characteristics associated with religiosity are a function not of belief itself, but of strong convictions and group identification." Catherine Caldwell-Harris notes that "non-believers" are interested in social justice concerns and posits that this is due to their lack of belief in an afterlife, leading to a focus on what can be fixed here and now. Another study by Caldwell-Harris describes atheists as being capable of experiencing awe, which she states debunks stereotypes of atheists as "cynical and joyless". A 2014 study created six different personality profiles of 'types' of nonbelievers and compared them to Big Five personality traits. In countries which have high levels of atheism such as Scandinavian nations, atheist organizations there generally have very low membership and only those that have links to a political party or offer legalized rituals have some noticeable membership. According to William Bainbridge's international study, atheism is common among people whose interpersonal social obligations are weak and is also connected to lower fertility rates in advanced industrial nations. In a global study on atheism, sociologist Phil Zuckerman noted that countries with higher levels of atheism also had the highest suicide rates compared to countries with lower levels of atheism. He concludes that correlations does not necessarily indicate causation in either case. A study on depression and suicide suggested that those without a religious affiliation have a higher suicide attempt rates than those with a religious affiliation. A study into mental well-being in religious and non-religious people found that mental well-being for both religious people and non-religious people hinged on the certainty of their belief, and that previous studies had not controlled for the effect of belonging to a group when studying churchgoers. Benjamin Beit-Hallahmi regarded atheists in Western society to be "much more likely to be a man, married, with higher education", and regarded the personality of atheists to be "less authoritarian and suggestible, less dogmatic, less prejudiced, more tolerant of others, law-abiding, compassionate, conscientious, and well educated. They are of high intelligence, and many are committed to the intellectual and scholarly life". A review of the literature found that being non-religious did not necessarily entail poorer mental health. Though atheists are in the minority in most countries, they are relatively common in Europe, Canada, Australia, New Zealand, East Asia and present communist states. It is difficult to determine actual atheist numbers. Furthermore, the conflation of terms such as atheist, agnostic, non-religious and non-theist add to confusion among poll data. According to the Encyclopædia Britannica, 2% of the world's population self-identify as atheists and the average annual global change for atheism from 2000 to 2010 was −0.17%. A 2002 survey by Adherents.com estimates the proportion of the world's people who are "secular, non-religious, agnostics and atheists" at about 14%. A 2004 survey by the BBC in 10 countries showed the proportion of the population "who don't believe in God" varying between 0% (Nigeria) and 39% (UK), with an average close to 17% in the countries surveyed, however, 8% of the respondents specifically stated that they consider themselves to be "atheists". Diversity was observed in the views of atheists including that "across the entire sample, almost 30% of all atheists surveyed said they sometimes prayed." 65% of those polled in a 2011 survey by the British Humanist Association answered no to the question "Are you religious?" A 2004 survey by the CIA in the World Factbook estimates about 12.5% of the world's population are non-religious, and about 2.4% are atheists. A 2005 poll by AP/Ipsos surveyed ten countries. Of the developed nations, people in the United States were "most sure" of the existence of God or a higher power (2% atheist, 4% agnostic), while France had the most skeptics (19% atheist, 16% agnostic). On the religion question, South Korea had the greatest percentage without a religion (41%) while Italy had the smallest (5%). A 2010 Pew Research global study found that 16 percent of the global population to be unaffiliated with a religion, however, Pew notes that "more than three-quarters of the religiously unaffiliated live in Asia, the majority in China. Many of the people in this group do hold some religious or spiritual beliefs and may even believe in a deity, but they do not identify with a particular faith." Of the global atheist and nonreligious population, 76% reside in Asia and the Pacific, while the remainder reside in Europe (12%), North America (5%), Latin America and the Caribbean (4%), sub-Saharan Africa (2%) and the Middle East and North Africa (less than 1%). Sociologist Phil Zuckerman's global studies on atheism have indicated that global atheism may be in decline due to irreligious countries having the lowest birth rates in the world and religious countries having higher birth rates in general. According to WIN/Gallup International, in their 2012 poll of 57 countries, 23% of respondents were "not religious" and 13% were "convinced atheists" and in their 2014 poll of 65 countries 22% were "not religious" and 11% were "convinced atheists". However, other researchers have advised caution with the WIN/Gallup International figures since other surveys which use the same wording, have conducted many waves for decades, and have a bigger sample size, such as World Values Survey; have consistently reached lower figures for the number of atheists worldwide. A Pew 2015 global projection study for religion and nonreligion projects that between 2010 and 2050 there will some initial increases of the unaffiliated followed by a decline by 2050 due to lower global fertility rates among this demographic. In terms of the United States, a 2012 Pew report showed that 32% of people under 30, 21% of people between the ages of 30-49, 15% of people between the ages of 50-64 and 9% of people over the age of 65 could be characterized as religiously unaffiliated. However, 68% of all the unaffiliated expressed belief in God and out of the whole US population, only 2.4% self identified as "atheist". A 2013 poll by UPI/Harris showed that three-quarters of U.S. adults say they believe in God, down from 82 percent in 2005, 2007 and 2009. Just under 2-in-10 U.S. adults described themselves as very religious, with an additional 4-in-10 describing themselves as somewhat religious down from 49 percent in 2007. Twenty-three percent of Americans identified themselves as not at all religious, nearly double the 12 percent reported in 2007. The 2015 Pew Religious Landscape survey reported that as of 2014[update], 22.8% of the American population is religiously unaffiliated, atheists made up 3.1% and agnostics made up 4% of the US population. A 1998 survey based on a self-selected sample of biological and physical scientists of the National Academy of Sciences in the United States found that 7% believed in the existence of God, 72.2% did not, and 20.8% were agnostic or had doubts. Eugenie Scott argued that there are methodological issues in the study, including ambiguity in the questions. A study on leading scientists in the US, with clearer wording and allowing for a broader concept of "god", concluded that 40% of prominent scientists believe in god. In 1916, 1,000 leading American scientists were randomly chosen from American Men of Science and 41.8% believed God existed, 41.5% disbelieved, and 16.7% had doubts/did not know; however when the study was replicated 80 years later using American Men and Women of Science in 1996, results were very much the same with 39.3% believing God exists, 45.3% disbelieved, and 14.5% had doubts/did not know. A 2014 survey by David Chalmers and David Bourget on nearly 1,000 professional philosophers from 99 leading departments of philosophy shows that 72.8% considered themselves as atheists, 14.6% considered themselves as theist, and 12.6% as something else. A TNSRMS Cameroun survey, commissioned by WIN-Gallup International, conducted from 29 October 2012, to 5 November, 2012, found that 3% of Cameroon were "convinced atheists." In November 2013, al-Sabah estimated that up to 3 million (3.57%) Egyptians were atheists. A TNS RMS Ghana survey, commissioned by WIN-Gallup International, conducted from 7 November 2012, to 33 November, 2012, found that 0% of Ghana were "convinced atheists." A Infinite Insight survey, commissioned by WIN-Gallup International, conducted on November, 2014, found that 2% of Kenya were "convinced atheists." A BJ Group survey, commissioned by WIN-Gallup International, conducted on 8 November, 2014, to 19 November, 2014 found that 1% of Morocco were "convinced atheists." A Market Trends International survey, commissioned by WIN-Gallup International, conducted from 13 October, 2014 to 9 November, 2014, found that 2% of Nigeria were "convinced atheists." A Topline Research Solutions (TRS) survey, commissioned by WIN-Gallup International, conducted from 24 December 2012, to 2 December, 2012, found that 4% of South Africa were "convinced atheists." A Infinite Insight survey, commissioned by WIN-Gallup International, conducted from 5 November 2012, to 6 December, 2012, found that 6% of South Sudan were "convinced atheists." A Emrhod International survey, commissioned by WIN-Gallup International, conducted from 24 November 2012, to 2 December, 2012, found that 0% of Tunisia were "convinced atheists." A ACSOR-Surveys survey, commissioned by WIN-Gallup International, conducted from 1 November, 2014 to 10 November, 2014, found that 0.33% of Afghanistan were "convinced atheists." A MPG LLC (Marketing Professional Group) survey, commissioned by WIN-Gallup International, conducted on November, 2014, found that 2% of Armenia were "convinced atheists." A SIAR Research and Consulting Group survey, commissioned by WIN-Gallup International, conducted from 16 October, 2014, to 12 November, 2014, found that 0.1% of Azerbaijan were "convinced atheists." A SRGB (SRG Bangladesh Limited) survey, commissioned by WIN-Gallup International, conducted from 5 November, 2014, to 25 November, 2014, found that 0.4% of Bangladesh were "convinced atheists." A GORBI (Georgian Opinion Research Business International) survey, commissioned by WIN-Gallup International, conducted from 15 October, 2014, to 15 November, 2014, found that 1% of the Georgia were "convinced atheists." A DataPrompt International survey, commissioned by WIN-Gallup International, conducted from 20 October, 2014 to 14 November, 2014, found that less than 3% of India were "convinced atheists." A Deka survey, commissioned by WIN-Gallup International, conducted from 15 October, 2014 to 5 November, 2014, found that 0.19% of Indonesia were "convinced atheists." According to Moaddel and Azadarmaki (2003), less than 5% of Iranians do not believe in God. A IIACSS survey, commissioned by WIN-Gallup International, conducted from 20 November 2012, to 2 December, 2012, found that 0% of Iraq were "convinced atheists." A Maagar Mochot ltd. survey, commissioned by WIN-Gallup International, conducted on November, 2014, found that 8% of Israel were "convinced atheists." A NRC (Nippon Research Center) survey, commissioned by WIN-Gallup International, conducted from 31 October, 2014 to 12 November, 2014, found that 32% of Japan were "convinced atheists." According to Inglehart et al (2004), less than 1% of those in Jordan do not believe in God. A Romir survey, commissioned by WIN-Gallup International, conducted from 23 October, 2014 to 30 October, 2014, found that 8% of Kazakhstan were "convinced atheists." According to Froese (2004), 7% of those in Kyrgyzstan are atheist. A REACH (Research and Consulting House) survey, commissioned by WIN-Gallup International, conducted from 17 October, 2014 to 5 November, 2014, found that 2% of Lebanon were "convinced atheists." A TNS Malaysia survey, commissioned by WIN-Gallup International, conducted from 27 October, 2014 to 15 November, 2014, found that 3% of Malaysia were "convinced atheists." According to Barret et al (2001), 9% of those in Mongolia are atheist. Barret et al (2001) report that 15% of North Koreans are atheist. A Gallup Pakistan survey, commissioned by WIN-Gallup International, conducted from 2 October, 2014 to 12 October, 2014, found that 1% of Pakistan were "convinced atheists." A Palestinian Center for Public Opinion (PCPO) survey, commissioned by WIN-Gallup International, conducted from 2 November, 2014 to 12 November, 2014, found that 1% of Palestine were "convinced atheists." A WisdomAsia survey, commissioned by WIN-Gallup International, conducted from 1 November, 2014, to 15 November, 2014, found that 61% of the People's Republic of China were "convinced atheists." A CSG survey, commissioned by WIN-Gallup International, conducted from 27 October, 2014, to 16 November, 2014, found that 34% of the Hong Kong were "convinced atheists." According to Inglehart et al (2004), 14% of those in the Republic of China do not believe in God. A PARC (Pan Arab Research Center) survey, commissioned by WIN-Gallup International, conducted on November 2011, found that 5% of Saudi Arabia were "convinced atheists." Inglehart et al (2004) found that 13% of those in Singapore do not believe in God. A Be Research (Index Kosova) survey, commissioned by WIN-Gallup International, conducted from 1 November, 2014 to 7 November, 2014, found that 6% of South Korea were "convinced atheists." According to Froese (2004), 2% of those in Tajikistan are atheist. A Infosearch survey, commissioned by WIN-Gallup International, conducted from 12 October, 2014 to 13 November, 2014, found that 1% of Thailand were "convinced atheists." According to Froese (2004), 2% of those in Turkmenistan are atheist. A Romir survey, commissioned by WIN-Gallup International, conducted from 16 November 2012, to 6 December, 2012, found that 2% of Uzbekistan were "convinced atheists." A Indochina Research survey, commissioned by WIN-Gallup International, conducted on 17 October, 2014, to 31 October, 2014 found that 13% of Vietnam were "convinced atheists." According to a 2010 Eurostat Eurobarometer Poll, 51% of European Union citizens responded that "they believe there is a God", whereas 26% answered that "they believe there is some sort of spirit or life force" and 20% said that "they don't believe there is any sort of spirit, God, or life force" and results were widely varied between different countries. According to another Poll about religiosity in the European Union in 2012 by Eurobarometer 16% are Non-believers/Agnostics and 7% are Atheists. 72% of EU citizens are Christians and 2% are Muslims. "Do not believe in God"
(*) 13% of respondents in Hungary identify as Presbyterian. In Estonia and Latvia, 20% and 19%, respectively, identify as Lutherans. And in Lithuania, 14% say they are “just a Christian” and do not specify a particular denomination. They are included in the “other” category. (**) Identified as "don't know/refused" from the "other/idk/ref" column are excluded from this statistic. (***) Figures may not add to subtotals due to rounding. According to the 2011 Albanian census found 2.5% of Albania were atheists. A Österreichisches Gallup Institute survey, commissioned by WIN-Gallup International, conducted on November, 2014, found that 13% of Austria were "convinced atheists." A Pew Research Center poll, conducted from June 2015 to July 2016, found that 2% of Belarus were atheists, while 9% stated that they "Do not believe in God". A iVOX bvba survey, commissioned by WIN-Gallup International, conducted from 28 October, 2014 to 18 November, 2014, found that 18% of Belgium were "convinced atheists." A Pew Research Center poll, conducted from June 2015 to July 2016, found that 2% of Bosnia and Herzegovina were atheists, while 4% stated that they "Do not believe in God". A Pew Research Center poll, conducted from June 2015 to July 2016, found that 2% of Bulgaria were atheists, while 17% stated that they "Do not believe in God". A Pew Research Center poll, conducted from June 2015 to July 2016, found that 4% of Croatia were atheists, while 10% stated that they "Do not believe in God". A 2010 Eurobarometer poll found that 3% of the Cyprus stated that "I don't believe there is any sort of spirit, God or life force". A Pew Research Center poll, conducted from June 2015 to July 2016, found that 25% of the Czech Republic were atheists, while 66% stated that they "Do not believe in God". A DMA/Research survey, commissioned by WIN-Gallup International, conducted on November, 2014, found that 12% of Denmark were "convinced atheists." A Pew Research Center poll, conducted from June 2015 to July 2016, found that 9% of Estonian population were atheists, while 45% stated that they "Do not believe in God". A Taloustutkimus Oy survey, commissioned by WIN-Gallup International, conducted from 19 October, 2014 to 7 November, 2014, found that 10% of Finland were "convinced atheists." 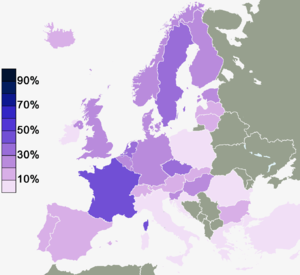 A BVA survey, commissioned by WIN-Gallup International, conducted from 20 October, 2014 to 23 October, 2014, found that 10% of France were "convinced atheists." A Produkt + Markt survey, commissioned by WIN-Gallup International, conducted on November, 2014, found that 17% of Germany were "convinced atheists." A Pew Research Center poll, conducted from June 2015 to July 2016, found that 3% of Greece were atheists, while 6% stated that they "Do not believe in God". A Pew Research Center poll, conducted from June 2015 to July 2016, found that 5% of Hungary were atheists, while 30% stated that they "Do not believe in God". A Capacent Gallup survey, commissioned by WIN-Gallup International, conducted from 29 October, 2014 to 12 November, 2014, found that 14% of Iceland were "convinced atheists." A Red C Research and Marketing survey, commissioned by WIN-Gallup International, conducted from 20 October, 2014 to 27 October, 2014, found that 10% of Ireland were "convinced atheists." A DOXA survey, commissioned by WIN-Gallup International, conducted from 16 October, 2014 to 30 October, 2014, found that 6% of Italy were "convinced atheists." A Be Research (Index Kosova) survey, commissioned by WIN-Gallup International, conducted from 1 November, 2014, to 7 November, 2014 found that 1% of Kosovo were "convinced atheists." A Pew Research Center poll, conducted from June 2015 to July 2016, found that 3% of Latvia were atheists, while 15% stated that they "Do not believe in God". A Pew Research Center poll, conducted from June 2015 to July 2016, found that 2% of Lithuania were atheists, while 11% stated that they "Do not believe in God". A BRIMA survey, commissioned by WIN-Gallup International, conducted from 1 November, 2014 to 24 November, 2014, found that 2% of the Republic of Macedonia were "convinced atheists." A 2010 Eurobarometer poll found that 2% of the Malta stated that "I don't believe there is any sort of spirit, God or life force". A Pew Research Center poll, conducted from June 2015 to July 2016, found that 1% of Moldova were atheists, while 3% stated that they "Do not believe in God". According to the 2011 Montenegro census found 1.24% of Montenegro were atheists. A December 2014 survey by the VU University Amsterdam found that 25% of the Netherlands were atheists. A 2010 Eurobarometer poll found that 29% of the Norway stated that "I don't believe there is any sort of spirit, God or life force". 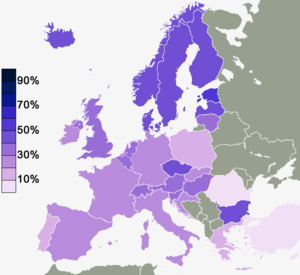 A deeper analysis of the 2010 Eurobarometer poll found that 9% of the Norway were atheists. A Pew Research Center poll, conducted from June 2015 to July 2016, found that 2% of Poland were atheists, while 8% stated that they "Do not believe in God". A Pew Research Center poll, conducted from June 2015 to July 2016, found that 4% of Romania stated that they "Do not believe in God". A Pew Research Center poll, conducted from June 2015 to July 2016, found that 4% of Russia were atheists, while 15% stated that they "Do not believe in God". A 2010 Eurobarometer poll found that 13% of the Slovakia stated that "I don't believe there is any sort of spirit, God or life force". A 2010 Eurobarometer poll found that 26% of the Slovenia stated that "I don't believe there is any sort of spirit, God or life force". According to the Center for Sociological Research found that in May 2017 that 10.2% of Spain were atheists. A Pew Research Center poll, conducted from June 2015 to July 2016, found that 2% of Serbia were atheists, while 10% stated that they "Do not believe in God". A CMA Research survey, commissioned by WIN-Gallup International, conducted from 20 October, 2014 to 31 November, 2014, found that 17% of Sweden were "convinced atheists." A Gallup Poll in 2016 reported that 18% of Swedes self report as atheist and 55% as non-religious. A Leger Switzerland survey, commissioned by WIN-Gallup International, conducted from 29 October, 2014 to 9 November, 2014, found that 12% of Switzerland were "convinced atheists." A Pew Research Center poll, conducted from June 2015 to July 2016, found that 3% of Ukraine were atheists, while 9% stated that they "Do not believe in God". A ORB International survey, commissioned by WIN-Gallup International, conducted from 19 November, 2014 to 28 November, 2014, found that 13% of the United Kingdom were "convinced atheists." A Leger survey, commissioned by WIN-Gallup International, conducted on November 2014, found that 12% of Canada were "convinced atheists." According to Barrett et al (2001), 7% of Cuba were atheist. According to Inglehart et al (2004), 7% of those in the Dominican Republic do not believe in God. A BRAIN Research survey, commissioned by WIN-Gallup International, conducted from 27 October, 2014, to 7 November, 2014 found that 4% of Mexico were "convinced atheists." A Dichter & Neira survey, commissioned by WIN-Gallup International, conducted from 16 October, 2014 to 19 October, 2014, found that 2% of Panama were "convinced atheists." A Colmar Brunton survey, commissioned by WIN-Gallup International, conducted from 4 November, 2014, to 11 November, 2014 found that 13% of Australia were "convinced atheists." A Tebbutt Research survey, commissioned by WIN-Gallup International, conducted from 1 November, 2014, to 15 November, 2014, found that 1% of the Fiji were "convinced atheists." The International Social Survey Programme was conducted by Massey University in 2008 found 13% of New Zealand were atheists. A Tebbutt Research survey, commissioned by WIN-Gallup International, conducted from 1 November, 2014 to 15 November, 2014, found that 0.41% of Papua New Guinea were "convinced atheists." A Voices! Research & Consultancy survey, commissioned by WIN-Gallup International, conducted on October 2014, found that 4% of Argentina were "convinced atheists." A IBOPE Inteligência survey, commissioned by WIN-Gallup International, conducted from 13 November, 2014, to 17 November, 2014 found that 2% of Brazil were "convinced atheists." According to Inglehart et al (2004), 3% of those in Chile do not believe in God. A Centro Nacional de Consultoría survey, commissioned by WIN-Gallup International, conducted from 1 November, 2014, to 7 November, 2014, found that 3% of the Colombia were "convinced atheists." A CEDATOS survey, commissioned by WIN-Gallup International, conducted from 31 October, 2014, to 20 November, 2014, found that 2% of the Ecuador were "convinced atheists." A DATUM Internacional survey, commissioned by WIN-Gallup International, conducted from 30 October, 2014 to 4 November, 2014, found that 2% of Peru were "convinced atheists." According to a study by Eric Kaufmann in 2010, 24% of Uruguay were atheists. ^ a b c d e f g Zuckerman, Phil (2006). "3 - Atheism: Contemporary Numbers and Patterns". In Martin, Michael (ed.). The Cambridge Companion to Atheism. pp. 47–66. doi:10.1017/CCOL0521842700.004. ISBN 9781139001182. ^ a b c Pasquale, Frank; Galen, Luke; Zuckerman, Phil (2016). "1. The Study of Secularity and the Nonreligious & 2. Secularity around the World". The Nonreligious: Understanding Secular People and Societies. Oxford University Press. ISBN 978-0199924943. ^ a b c "Major Religions of the World Ranked by Number of Adherents". Adherents. Secular/Nonreligious/Agnostic/Atheist: This is a highly disparate group and not a single religion. Although atheists are a small subset of this grouping, this category is not synonymous with atheism. People who specify atheism as their religious preference actually make up less than one-half of one percent of the population in many countries where much large numbers claim no religious preference...In most countries only a tiny number of people (zero to a fraction of 1 percent) will answer "atheism" or "atheist" when asked an open-ended question about what their religious preference... A slightly larger number answer "no" when asked simply if they "believe in God" (omitting wording indicating more nebulous, less anthropomorphic conceptions of divinity)...Estimates for atheism alone (as a primary religious preference) range from 200 to 240 million. But these come primarily from China and former Soviet Union nations (especially Russia). ^ Keysar, Ariela. "2. Religious/Non-Religious Demography". In Shook, John; Zuckerman, Phil (eds.). The Oxford Handbook of Secularism. Oxford University Press. The share of atheists is far smaller than the share of not religious in most countries. ^ a b Keysar, Ariela; Navarro-Rivera, Juhem (2017). "36. A World of Atheism: Global Demographics". In Bullivant, Stephen; Ruse, Michael (eds.). The Oxford Handbook of Atheism. Oxford University Press. ISBN 978-0199644650. ^ a b c d "The Global Religious Landscape - Religiously Unaffiliated". Pew Research Center. December 2012. ^ a b "Global Index of Religion and Atheism" (PDF). WIN/Gallup International. Archived from the original (PDF) on 16 October 2012. Retrieved 13 January 2015. ^ Pew Forum on Religion; Public Life (2012-12-18). "The Global Religious Landscape". Retrieved December 18, 2012. ^ Baggini, Julian (2009). Atheism: A Brief Insight. New York: Sterling. p. 110. ISBN 978-1-4027-6882-8. ^ "Millennials Losing Faith In God: Survey". Huffington Post. Huffingtonpost.com. 2012-06-05. Retrieved 2014-02-27. reporting on a Pew study: "Section 6: Religion and Social Values | Pew Research Center for the People and the Press". People-press.org. 2012-06-04. Retrieved 2014-02-27. ^ a b "Not All Nonbelievers Call Themselves Atheists | Pew Research Center's Religion & Public Life Project". Pewforum.org. 2009-04-02. Retrieved 2014-02-27. ^ Rieke Havertz (2012-08-15). "Atheism on the rise around the globe". CSMonitor.com. Retrieved 2014-01-06. ^ International Humanist and Ethical Union. "The Fate of Infidels and Apostates under Islam". Iheu.org. Archived from the original on 2011-09-27. Retrieved 2012-02-05. ^ "American Nones: The Profile of the No Religion Population" (PDF). American Religious Identification Survey. 2008. Archived (PDF) from the original on 29 April 2015. Retrieved 19 October 2012. ^ "No Religion on the Rise: One-in-Five Adults Have No Religious Affiliation". Pew Forum on Religion & Public Life. 9 October 2012. Retrieved 19 October 2012. ^ "The World Fact Book: Religions". World Fact Book. Retrieved 8 June 2013. ^ a b c Eller, Jack (2010). "1. What Is Atheism?". In Phil Zuckerman (ed.). Atheism and Secularity Vol.1: Issues, Concepts, Definitions. Praeger. ISBN 9780313351839. ^ a b Halman, Loek (2010). "8. Atheism And Secularity In The Netherlands". In Phil Zuckerman (ed.). Atheism and Secularity Vol.2: Gloabal Expressions. Praeger. ISBN 9780313351839. ^ "Canadians divided on whether religion does more harm than good: poll - WorldWide Religious News". Wwrn.org. 2011-09-12. Retrieved 2014-01-06. ^ "Canadians divided on whether religion does more harm than good: poll". Shaw Media Inc. 2011-09-12. Retrieved 31 December 2011. ^ Kuo, Cheng-Tian (2017). "15. Sacred, Secular, and Neo-sacred Governments in China and Taiwan". In Zucekrman, Phil; Shook, John (eds.). The Oxford Handbook of Secularism. Oxford University Press. ISBN 9780199988457. ^ a b "UK among most secular nations". BBC News. 2004-02-26. Retrieved 2005-03-05. ^ Paul, Gregory (2010). "6. The Evolution of Popular Religiosity and Secularism". In Zuckerman, Phil (ed.). Atheism and Secularity Vol. 1: Issues, Concepts, and Definitions. Praeger. pp. 171–172. ISBN 978-0313351815. Nor is it likely that most atheists and agnostics base their decision to not believe in the gods on a careful, rational analysis of the pertinent philosophical and scientific arguments. As noted earlier Europeans score about as poorly on tests of scientific knowledge as do the more religious American population. The common perplexment of rationalists that so many people are superstitious is psychosociologically naive, most people do not care all that much about scientific rationalism, which explains why three quarters of Americans and many other Westerners believe in something paranormal aside from gods (Sjodin 2002, Gallup 2005a). ^ a b c Farias, Miguel (2013). "30. Psychology of Atheism". In Bullivant, Stephen; Ruse, Michael (eds.). The Oxford Handbook of Atheism. Oxford: Oxford Univ. Press. ISBN 978-0199644650. ^ Pasquale, Frank; Galen, Luke; Zuckerman, Phil (2016). "5. How and Why People Become Secular". The Nonreligious: Understanding Secular People and Societies. Oxford University Press. ISBN 978-0199924943. ^ a b "Center Stage Podcast, Episode 104 - Profiles of the Godless: Results from the Non-Religious Identification Survey, Luke Galen". Centerforinquiry.net. 2011-12-05. Retrieved 2012-02-05. ^ Galen, L.W., & Kloet, J. (2011). "Personality and social integration factors distinguishing non-religious from religious groups: The importance of controlling for attendance and demographics". Archive for the Psychology of Religion, 33, 205-228. ^ Caldwell-Harris, Catherine L. (February 2012). "Understanding atheism/non-belief as an expected individual-differences variable". Religion, Brain & Behavior. 2 (1): 4–23. doi:10.1080/2153599X.2012.668395. ^ Caldwell-Harris, Catherine L.; Wilson, Angela L.; LoTempio, Elizabeth; Beit-Hallahmi, Benjamin (12 October 2010). "Exploring the atheist personality: well-being, awe, and magical thinking in atheists, Buddhists, and Christians". Mental Health, Religion & Culture. 14 (7): 659–672. doi:10.1080/13674676.2010.509847. ^ Silver, Christopher F.; Coleman, Thomas J.; Hood, Ralph W.; Holcombe, Jenny M. (13 December 2014). "The six types of nonbelief: a qualitative and quantitative study of type and narrative". Mental Health, Religion & Culture. 17 (10): 990–1001. doi:10.1080/13674676.2014.987743. ^ Bainbridge, William (2005). "Atheism" (PDF). Interdisciplinary Journal of Research on Religion. 1 (Article 2): 1–26. ^ Zuckerman, Phil (2007). Martin, Michael (ed.). The Cambridge Companion to Atheism. Cambridge Univ. Press. pp. 58–59. ISBN 978-0521603676. ^ Dervic, K; Oquendo, MA; Grunebaum, MF; Ellis, S; Burke, AK; Mann, JJ (December 2004). "Religious affiliation and suicide attempt". The American Journal of Psychiatry. 161 (12): 2303–8. CiteSeerX 10.1.1.629.8080. doi:10.1176/appi.ajp.161.12.2303. PMID 15569904. ^ Galen, Luke William; Kloet, James D. (13 October 2010). "Mental well-being in the religious and the non-religious: evidence for a curvilinear relationship". Mental Health, Religion & Culture. 14 (7): 673–689. doi:10.1080/13674676.2010.510829. ^ Beit-Hallahmi, Benjamin (2007). "Atheists: A Psychological Profile". In Martin, Michael (ed.). The Cambridge Companion to Atheism. Cambridge [England]: Cambridge University Press. pp. 300–318. ISBN 9781139001182. ^ Weber, Samuel R.; Pargament, Kenneth I.; Kunik, Mark E.; Lomax, James W.; Stanley, Melinda A. (1 October 2011). "Psychological Distress Among Religious Nonbelievers: A Systematic Review". Journal of Religion and Health. 51 (1): 72–86. doi:10.1007/s10943-011-9541-1. PMID 21965058. ^ "Religion: Year in Review 2010: Worldwide Adherents of All Religions". Encyclopædia Britannica Online. Encyclopædia Britannica Inc. Retrieved 2013-11-21. ^ "Major Religions of the World Ranked by Number of Adherents". Adherents.com. Retrieved 2006-03-05. ^ "Two-thirds of Britons not religious, suggests survey". BBC News. 2011-03-21. ^ "CIA World Factbook". Archived from the original on 2006-12-27. Retrieved 2006-03-05. ^ "AP/Ipsos Poll: Religious Fervor In U.S. Surpasses Faith In Many Other Highly Industrial Countries". 2005. Retrieved 2006-03-05. ^ "Losing our religion? Two thirds of people still claim to be religious" (PDF). WIN Gallup International. April 13, 2015. ^ "The Future of World Religions: Population Growth Projections, 2010-2050". Pew Research Center. April 5, 2012. ^ ""Nones" on the Rise". Pew Research Center. 2012-10-09. Retrieved 2012-10-09. ^ "U.S. belief in God down, belief in theory of evolution up". 2013. Retrieved 2013-12-22. ^ "America's Changing Religious Landscape". Pew Research Center. May 2015. ^ Larson, Edward J.; Larry Witham (1998). "Leading scientists still reject God". Nature. 394 (6691): 313–4. doi:10.1038/28478. PMID 9690462. Archived from the original on 2014-03-01. ^ Scott, Eugenie (2016-03-04). "Do Scientists Really Reject God? : New Poll Contradicts Earlier Ones". Reports of the National Center for Science Education. National Center for Science Education. ^ Larson, E. J. & Witham, L., "Scientists are still keeping the faith,", Nature 386, 435-436 (1997). ^ a b c d e f g h i "GLOBAL INDEX OF RELIGIOSITY AND ATHEISM" (PDF). ^ "بوابة الصباح : الملحدون فى مصر .. كفار فى العلن مؤمنون فى السر". www.elsaba7.com. ^ a b c d e f g h i j k l m n o p q r s t u v w x y z aa ab ac ad ae af ag ah ai aj ak al am an ao ap aq ar as at au av aw Creative, Studio X. "Regional Results, End of Year survey, global survey, happiness in America, Happiness in Europe, happiness in the world, expectations 2015, WIN/Gallup International, George Gallup, expectations 2015, outlook 2015, happiness in 2014". www.wingia.com. ^ a b c d e f g h i j k l m n o p q r s t u v w x y z aa ab ac ad ae af ag ah ai aj ak al am an ao ap aq ar as at au av "End of Year 2014 Methodology" (PDF). ^ a b c d e f g h i j k l "Atheism: Contemporary Rates and Patterns Phil Zuckerman" (PDF). ^ "Türkiye'de ateist sayısı neden arttı?". ^ a b c d e f g h "Special Eurobarometer: Biotechnology" (PDF). October 2010. p. 381. Archived from the original (PDF) on 2010-12-15. ^ "Discrimination in the EU in 2012" (PDF), Special Eurobarometer, 383, European Union: European Commission, p. 233, 2012, archived from the original (PDF) on 2 December 2012, retrieved 14 August 2013 The question asked was "Do you consider yourself to be...?" With a card showing: Catholic, Orthodox, Protestant, Other Christian, Jewish, Muslim, Sikh, Buddhist, Hindu, Atheist, and Non-believer/Agnostic. Space was given for Other and Don't know. Jewish, Sikh, Buddhist, Hindu did not reach the 1% threshold. ^ a b "Discrimination in the EU in 2012" (PDF), Special Eurobarometer, 393, European Union: European Commission, p. 233, 2012, archived from the original (PDF) on 2 December 2012, retrieved 14 August 2013 The question asked was "Do you consider yourself to be...?" With a card showing: Catholic, Orthodox, Protestant, Other Christian, Jewish, Muslim, Sikh, Buddhist, Hindu, Atheist, and Non-believer/Agnostic. Space was given for Other (SPONTANEOUS) and DK. Jewish, Sikh, Buddhist, Hindu did not reach the 1% threshold. ^ a b c d e f g h i j k l m n o p q "Religious Belief and National Belonging in Central and Eastern Europe". Pew Research Center's Religion & Public Life Project. 10 May 2017. Retrieved 29 May 2017. ^ "2011 Census-AL" [2011 Census-AL] (PDF) (in Albanian). INSTAT. 2011. Retrieved 16 April 2017. ^ "Special Eurobarometer: Biotechnology" (PDF). October 2010. p. 383. ^ Centro de Investigaciones Sociológicas (Centre for Sociological Research) (May 2017). "Barómetro de mayo de 2017" (PDF) (in Spanish). Retrieved 4 June 2017. ^ "Religion In New Zealand: International Social Survey Programme" (PDF). Massey University. Retrieved 2010-06-10.